I went to college at the University of Pennsylvania, which is not a fabulous computer science school, but it’s not a bad one either. Over the years, the thing I realize about Penn is how interesting my classmates are. 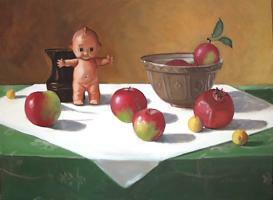 One friend from college days is Nancy Bea Miller, who is a very good painter (below: Still Life with Kewpie). Coincidentally, she, like me, is the parent of three boys, one of whom is autistic. And she blogs these experiences, at Genre Cookshop. It is much more personal, and therefore meaningful, than for example, this blog.